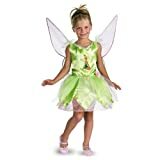 When parents think about dressing their children in fairy costumes most of us immediately begin to think about Tinkerbell Halloween costumes. There are, however, other fairy outfits to choose from this year. One of our favorite ideas is the newly released Silvermist fairy costume. In 2008, Disney released the cute, animated 3D movie Tinker Bell. In this film, we are introduced to a few of Tinkerbell’s friends including Rosetta, Fawn, Iridessa, and, of course, Silvermist. Every fairy is born with a special talent. Silvermist is a water fairy and specializes in making dewdrops. This precious blue fairy makes for a really adorable costume choice. 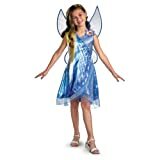 If your child is looking for a unique fairy costume for Halloween this year consider dressing her as Silvermist. This stunning fairy outfit is absolutely beautiful and is elegantly accented in multiple shade of blue, white, and yellow. Also included are sheer white fairy wings accented with blue trim. Even better is the fact that this costume has just been released in 2010 making it more and more unlikely that someone at your kid’s party will have the same costume. Vidia and Rosetta costumes are also new and available for this Halloween. 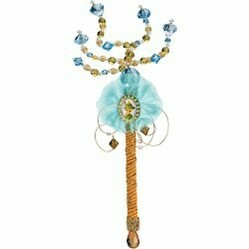 Tinkerbell is perhaps the most popular fairy of all time. Originally created for a play in 1904, JM Barrie later included this new character in his 1911 novel that he called ‘Peter and Wendy‘. Later on, in 1953, Walt Disney also included Tinker Bell in his famous story about Peter Pan, the boy who never grew up. It is difficult to imagine now, but in Disney’s version Tink had only a small, minor role and her character was typically described as a ‘common fairy’. She certainly cannot be considered common now, can she? I don't know about you, but finding the perfect Halloween costume for a child can be extremely difficult. As parents, we want our children to look super cute yet we want them to still look like children. In today's world, manufacturers often make their kids Halloween costumes look exactly like the costumes made for adults. I, for one, would rather my child remain a kid for as long as possible. They will have plenty of time to grow up and be adults later in life. Perhaps this is why I am such a huge fan of fairy costumes for girls. They not only look great, they are also age appropriate. What Do You Think About These Silvermist Costume Ideas?